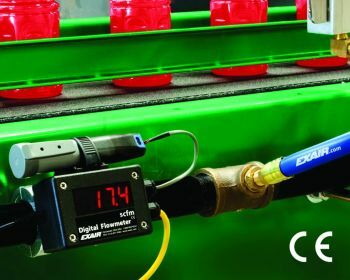 EXAIR's Digital Flowmeter provides an excellent way to monitor compressed air consumption and waste. Now, with the addition of EXAIR's new USB Data Logger, you can also maintain a history of the Digital Flowmeter's measurements for analysis. Use the included software to configure the Data Logger to record your flow rate. Record from once a second (about nine hours of data) up to once every 12 hours (over 2 years!). Regular monitoring of compressed air usage makes it possible for companies to save thousands of dollars per year in compressed air waste by identifying costly leaks or inefficient air products. When the Data Logger is removed from the Digital Flowmeter and plugged into a computer, the data can be viewed in the included software or exported directly into Microsoft Excel®. This allows you to track flow rate easily on your computer. The Data Logger is available pre-installed on the Digital Flowmeter. Summing Remote Displays, that make it easy to monitor compressed air consumption from a convenient location, are also available.